In a digital era where the world revolves around technology than ever before, more businesses are leveraging videos in their recruiting and hiring process to save time and increase productivity. Whether it's in the construction, engineering, or environmental industry, video interviews is a winning move for companies and interviewees alike as each are able to determine whether the choice is a good fit efficiently. Yet, just because it's a video interview doesn't make it less nerve wrecking or easier on your part. Preparation is vital in order to land the job of your dream particularly if this video interview is the gateway. Ensuring you're ready in advanced positions you to win so you're confident in your delivery and make an amazing impression with your potential employer. Just as you would for an in-person interview, it's important to go over likely questions that will be asked so you respond with conviction and belief. You see, the more you go over your answers, the poised and certain you'll be during the interview. You'll clearly highlight your skills and knowledge in a way that's concise yet still showcases your expertise for the job. You also won't fumble over your words nor get too long-winded in your response. So we can agree that practice makes perfect. Spend the time going over common interview questions and your answers so you're adequately prepared. Say them aloud as if you're speaking directly to the interviewer. Review your resume to fluently share your experiences that relate to the position. Finally, research the company and their goals. Understand their mission and the capacity in which they serve their clients. When doing so, you'll identify how you can fit into their vision and communicate this during the video interview. Great posture emanates confidence and enthusiasm for the subject matter. Practice keeping your spine straight with your shoulders slightly pulled back for an upright posture. This position also helps your breathing which is a key factor in relieving any nervousness experienced during the video interview. Another tip to bolstering your posture and poise is talking with your hands, however, don't overdo it. Use them as a tool to help release any nervous energy or show your interest while answering a question. 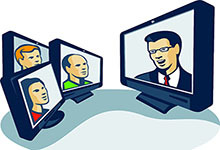 From Skype to Google Hangouts, GoToWebinar and Zoom, there are several options employers can choose as their video technology for the interview. It's important to test the software in advance to ensure its working properly. For example, some applications may need to be downloaded prior to the interview if you don't already have them installed on your computer. Avoid waiting until the day of to discover if your device is equipped or not. Know the software that will be used and perform a test run 1-2 days before the interview so you're ready! If possible, test it with a friend on the software that you'll be using. Get their feedback on the lighting, surrounding background and your posture. People are seeking authenticity and transparency in an age where communication is often conveyed through technology. Allow the interviewer to experience your true personality, showing how you'll be a real asset to the team. Don't be afraid to exude passion and zeal for the position you're after. Be yourself... that's what they're looking for! Preparing for a video interview does not have to be a daunting task. By implementing these tips, you will create an environment for success to boost your interview performance and land you the job you desire in the construction, engineering, or environmental industry.